Step out from your Washington hotel with this handy itinerary for a short getaway in Washington and be sure to see the city’s best. A Washington city vacation reveals American political life and some of the nation’s finest monuments and museums. Book a Washington hotel and uncover the United States’ most treasured possessions. Washington, D.C.’s extensive shopping scene is as eclectic as you'd expect from the sprawling US capital. Visitors searching for a unique buy will discover the upscale antique stores and open-air craft markets. There's also a handful of shopping malls, rows and rows of independent and brand name boutiques, and small hidden clusters of weird and wacky thrift stores. In other words, there’s enough in D.C. to satisfy the pickiest shopper. Fittingly for a city with such an influence on the world, Washington, D.C. boasts a vibrant, global cuisine culture. A mix of both affordable and fancy Thai and Chinese restaurants fill the central streets, providing no shortage of soy-dappled, lemongrass-infused delights. Washington also has its fair share of Mexican and Italian eateries, and more than a hint of sumptuous home-style Southern cooking. For a quick bite, there’s a wealth of inexpensive tasty chain takeaways too. 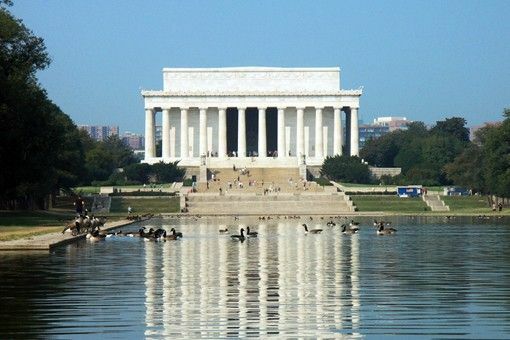 Top 10 historic things to do in Washington D.C.
American history is etched in Washington’s streets. Presidential monuments and the world’s largest museum complex bring the past alive. Book your Washington hotel, and follow this guide to the very best of historic Washington. Whether you want to star gaze or explore great civilisations, this guide to the top 10 museum destinations in the world will help you choose where to book your hotel. Spring vacations in Washington D.C.
A spring vacation in Washington brings warm sunshine, casual strolls along the National Mall and nearly 4,000 cherry trees in bloom. Book a Washington hotel and watch the city come to life. Finding just the right neighborhood for your Washington hotel stay makes all the difference. Use this handy guide to choose where to stay in Washington. Stay in a Washington hotel near the White House, by the waterfront in Georgetown or alongside trendy boutiques in Dupont Circle. Choose the place that is right for you with this guide to the top 10 hotels in Washington.